In Buddhism, Green Tara is often referred to as the women’s ally. 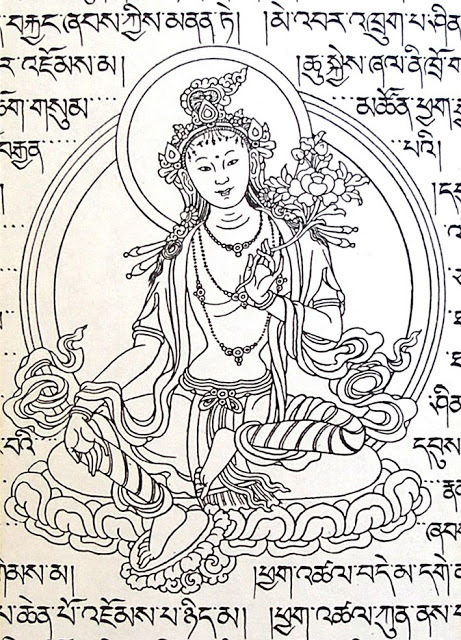 Her mantra is : oṃ tāre tu tāre ture soha. I highly recommend to everyone – especially women – to memorise it, and repeat it to yourself whenever you can, especially in those moments when fear or anxiety arise or when one needs strength or courage. It could also be written down on a piece of paper and kept in your pocket. I used to think that if I could ever have a superpower, I’d like mine to be invisibility. As a child, teenager and young adult, I used to imagine how much fun it would be to become invisible whenever I wanted to. Since becoming a mother, nearly 7 and half years ago, countless sleepless nights and a couple of extra waist sizes later and my wish came true. When people file you in the “Mum” category you become invisible to most people. It made me feel like a transparent, ghost-like entity at first. “As a child I longed for a cloak that would make me invisible. For a woman, middle age is that cloak. I hear this idea expressed in different ways: ” I have reached the age of invisibility.” “No one seems to notice me anymore.” And so on. This is both a blessing and a bane. At long last, after serving as a magnet for men and a vessel for reproduction, we finally own our lives again. We can go about our business unmolested, free to be who we are rather than who others want us to be. We are persons again, as we haven’t been since we were prepubescent girls. The disadvantage is that even when we want to be noticed, we probably won’t be. – The knitting sutra: craft as a spiritual practice – Susan Gordon Lydon. I’d be lying if I said it wasn’t depressing at times and that my ego didn’t get bruised, but once you get over the depressing shock of it, it is indeed a liberating experience. The advantages of being invisible outweight the down sides. I may be not so invisible yet that I can sneak in anywhere completely unnoticed (I’m hoping to get there in about 10-15 years or so), but I can sit back and observe a lot of things without being noticed. My see-through status allows me to see a lot of teenagers and young women – just like the one I used to be – being in that common situation where they become paranoid/overly self-conscious because people often can’t stop looking at them. They walk about with the feeling that they are constantly being watched and scrutinised by their peers and by men (of all ages). They haven’t found themselves, yet they put this pressure on themselves: trying to mirror back to others the reflection they want to see in an attempt at meeting their expectations. It’s all very exhausting. Not having to feel like that is very liberating. You realise that there are a lot of good things about ageing and (slowly but surely) progressing towards middle age which can make it worth losing your younger looking self. Rewind a few years back when the doors of motherhood opened before you, and you became entirely of service to somebody else. Back then your world was turned upside down as you questioned every single one of your beliefs, while you were reflecting on what is essential and what isn’t and what you want to pass on to your child(ren). Ever since that very first day you tried your best to hold it – the family – together, to make sure your kids feel that they learn to walk on a strong and steady rock and not on the sinking sands you sometimes get stuck in, in your own heads. This practice of putting someone else before you enriches you immensely, as you get to practice true-selflessness. You’re doing your best for others, and you don’t get any praise for it. No one is looking, it’s not glorifying or glamorous to have milk patches showing through your top or to be covered in regurgitated food. It’s just you, the unsung hero, in your bare state. You carry your own struggles. You have good days and bad days. You are doing the best you can to love and give unconditionally. And patiently. Once you can do this for your children then you can duplicate this feeling towards others. Giving birth to your first child and to yourself as a mother is a great opportunity to experience that: for when you become a mother you truly become a woman. But something has to go, you have to sacrifice something, and that’s the other side of that coin: you have to give up your young, appealing self. You age. Real problems come up with the responsibility of having this new being’s upbringing under your care. You will have to give up sleeping, basic self-care, me time – temporarily, at least – but you will get many, many, many chances to test and improve your stress management issues and your patience skills. This motherhood thing will push you to the limits of your own sanity. You may reach, like me, the rock bottom of post natal depression – temporarily at least. But in doing so, you get to know yourself better, and you grow, you learn new skills, you gain confidence that you, yes YOU can do this and through all these experiences – the good, the bad, and the ugly – you become a woman and a wiser person. If it wasn’t for ageing you wouldn’t get these golden opportunities of self-discovery and self-knowledge which are essential components towards self-liberation. 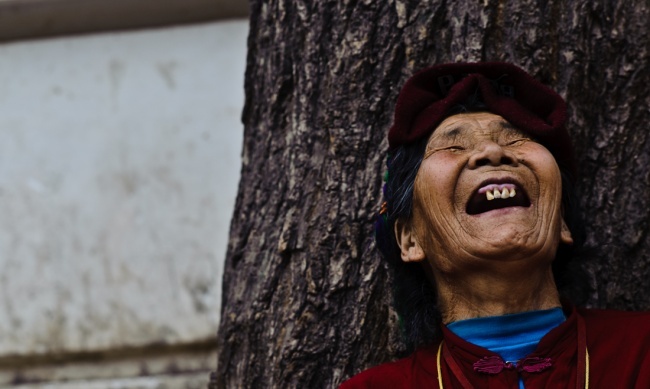 Picture Francois de Halleux – Pictures of his trip in Tibet. As you age you get to fully discover who you are and what is your soul’s longings. You don’t care so much what other people may think of you. You have known enough hard times to fully appreciate when life is easier and all is well! I’m turning 37 at the end of the week. I need to write that one down, because I never remember how old I am. Not because I am getting forgetful with age, but because it doesn’t really mean anything to me. As I got older, I started to fully appreciate my connection to womankind. Until I became a mother, I was a proudly self-proclaimed tomboy. Now I haven’t become Marilyn Monroe with age, but I’m more feminine. In a scruffy way. So hail to ageing and invisibility! Thank you :) you are so very kind! Happy Birthday for the end of the week! I turn 40 on Thursday so I’m right there with you on turning the page on another year in the chapter book of life. Like you, I’m not bothered by age – not even to be entering the dreaded “forties” so many of my peers quaked about. There were other aspects of your interesting post I could also identify with. I too experienced “invisibility” when I became a mother – though I didn’t recognize what was amiss with me for a while. For me it was about losing my identity and not having time in my life any more for the things that helped shore up my sense of self. I’ve gradually been reclaiming space in my life for myself as my children have grown older and more independent. Then I emigrated and am suffering another identity crisis as I have been set back to square one of adult experience in so many spheres and because I’m adjusting to solo parenting (not single parenting – my husband just works away a lot). It’s a gradual process of refunding myself and discovering who I am now. I could even identify with what you wrote about being a tomboy. I was always a tomboy scruff but as I became surrounded by more and more males I found I became drawn to a few more feminine things. I didn’t own any pink clothing until a few years ago. I’m still pretty much a tomboy. I still don’t wear make up and my hair is constantly scruffy but now I’m a tomboy scruff with a feminine twist just as you describe. Thanks for the interesting post. It really made me reflect. I loved this musing…..I so get most of it! Motherhood came like a tidal wave, crushing everything I knew, washing me up on a very strange, sometimes hostile, unfamiliar island. Here I’m still trying to build on moving sand, longing for a lifeboat out to safer lands, wondering how I got here from there…….So ‘not quite ready’ to embrace invisibility, as I sink deeper into the quicksand. Then the purest, most sacred voice calls out ‘I love you mum’ and I know what is really important…..The love in your heart and how you share it…….